What is the most played, most popular computer game ever? Is it a racing, shooting or fighting game? None of the above. It's a card game! The game we are talking about is Klondike Solitaire, also more commonly known as Solitaire. The game has been included in all operating systems by Microsoft since 1990. 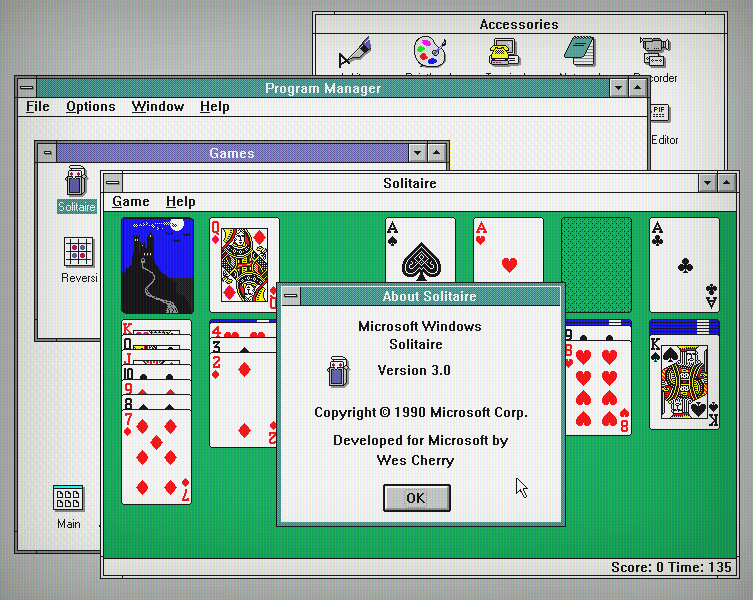 The first version can be found on Windows 3.0 and even the current version of the system still includes the game for free, together with other famous card games such as Freecell, Spider Solitaire, Tri Peaks and Pyramid Solitaire. You'd almost think that Microsoft had invented the game, but nothing is further from the truth. The game is centuries old and a lot is unknown about the history of Solitaire. We can definitely say, however, that no one would have heard of the game in this day and age if Microsoft had not decided to publish it. They are the ones who made it famous across the world. And the person who initially developed this game for Microsoft was an intern called Wes Cherry, who created his very first version in 1988. When he had finished the game, he showed it to a number of coworkers, who were sold on the idea immediately, so management decided to add the game to Windows 3.0 (see image above). The design of the cards was created by Susan Kare, who was also the designer of the very first Apple icons. It goes without saying that Microsoft was very happy to see the game turn into a huge hit, since it was the first time in history that a computer game went viral and playing the game was the perfect way to get new users of personal computers introduced to using a mouse and keyboard. Many people got their first personal computer at the start of the nineties and they had never, ever had their hands on a mouse before, let alone played a game on a computer screen. The users were used to typewriters and, when they played card games, they did so using a physical pack of cards. Now, on their computer, they could suddenly get their PC to deal a new stack of cards with a single mouse click rather than having to go through the trouble of shuffling the cards by hand. Partly thanks to this user-friendliness, simple design, relaxing colors and high level of addiction, this game is still being played by millions of people today. Solitaire resulted in a pretty big reduction in productivity at many offices. What do you think the most used Microsoft Windows application is? It's not Outlook, Word or Excel. In fact, it's Solitaire! Most people who work or used to work in an office can tell you about the attraction of the game and can probably point out a few colleagues who spent just a little too much time playing the game. There are even people who have lost their jobs: a well-known story is that of government employee Edward Greenwood IX, who was fired in 2006 because the then mayor of New York, Michael Bloomberg, happened to walk past the man's computer and saw the Solitaire game on his screen. But it's not all bad news. Research carried out by a well-known university has shown that people who were allowed to play Solitaire on their computer were much more productive than colleagues who were not allowed to do so. The games functioned a bit like a bathroom break, giving the staff the chance to do something different for a while, so they felt more energized and got back to work in good spirits. But still, you're unlikely to find games on most work-related computers because they will have been removed at the request of the boss. Luckily, our site SolitaireCardGames.com is always online, 24 hours a day, 7 days a week, completely free, both at home and at work. So, if you need to boost your energy or you just feel like a fun game of Solitaire, you know where to find us!